October is LGBTQ History Month, and The Graduate Center Library is excited to announce the opening of a new library display, “Thousands of Ghostly Sheaves: A History of Queer Studies at CUNY.” Materials selected for the exhibit were drawn from the archives of the Center for LGBTQ Studies (CLAGS, located at the Graduate Center in Room 7115). 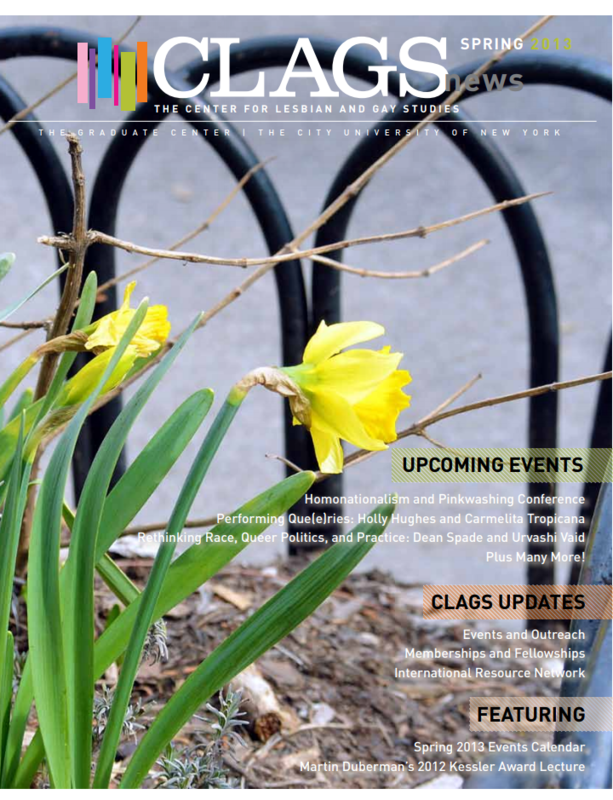 CLAGS holds the unique distinction of being the first academic LGBTQ research center in the United States. Founded in 1991, under the leadership of Martin Duberman, CLAGS was integral to the growth and direction of Queer Studies as a field of scholarly inquiry. 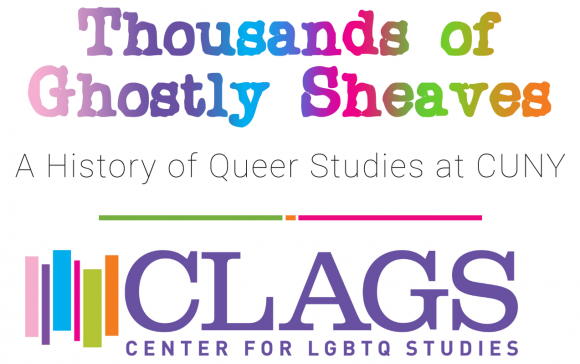 Through its research fellowships and innovative public programming, CLAGS continues to serve as a dynamic network for emerging queer scholarship. CLAGSNews provides a detailed record of the events, publications, and cultural happenings sponsored or supported by the organization over the past 27 years. Published excerpts of the annual David R. Kessler Lectures include works by Susan Stryker, Adrienne Rich, and Gayle Rubin, and others. A list of donors and CLAGS membership further displays the reach of the LGBTQ scholarly community and its allies and supporters. Conferences described in the newsletters include “Homoeconomics” (1994); “Black Nation, Queer Nation” (1995); “Intersexions of Queer Visual Culture at the Crossroads” (2004); “Trans Politics, Social Change, and Justice” (2005); “In Amerika They Call Us Dykes” (2011). The Graduate Center library has received the donation of the CLAGSNews digital collection and intends to place its material in the CUNY Academic Works repository. This exhibition commemorates this venture and showcases the rich history and scope of queer studies as it has manifested at CUNY, and representing decades of LGBTQ scholarship.